This article explains the drad-and-drop of grid items. It consists of the following sections. This will make the grid data rows draggable and the end user will be able to relocate them if needed. Additionally, you can define a GridDragDropColumn in your GridTableView's Columns collection. This will make your grid items draggable only when grabbed by the drag handle in the GridDragDropColumn. For a live demo, please refer to the RadGrid Items Drag-and-Drop live example. 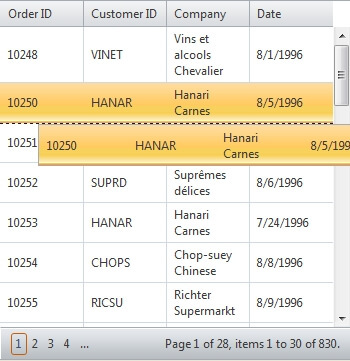 Furthermore, depending on the position you drag an item (above or below other record) it will be placed respectively above or below the corresponding grid item. This is meaningful only when you reorder rows within the same RadGrid or from one RadGrid to another. The event-driven model which allows you to process and complete the drag and drop operation can be separated into two phases: client-side and server-side phase. There are two phases when the user drags and drops rows. The first is the client-side action in the browser, and if that is not cancelled by the developer, a postback is made so the server can be notified of the data change (e.g., so you can update your data sources). The information below explains what you can do in each phase. There are three client grid events exposed to handle drag/drop action: OnRowDragStarted (cancelable), OnRowDropping (cancelable) and OnRowDropped. The OnRowDragStarted event can be intercepted if you want to perform some conditional check and determine whether to cancel the drag operation or not. The syntax of the event handler follows the general client-side event signature of RadGrid for ASP.NET AJAX. The row which is about to be dragged can be accessed through the get_gridDataItem() property of the second argument passed in the OnRowDragStarted handler. The OnRowDropping event should be attached to identify the target element on which the dragged grid record is dropped. If this element does not meet your criteria for acceptable target, cancel the operation by setting args.set_cancel(true) where args is the second argument passed to the OnRowDropping handler. Additionally, to determine the destination element or set it explicitly use the get_destinationHtmlElement() and set_destinationHtmlElement() properties that can be accessed through the args argument in the handler. Again, the syntax of the event handler follows the general client-side event signature of RadGrid for ASP.NET AJAX. The OnRowDropped event can be handled if you would like to execute some extra code logic prior to the server-side OnRowDrop event rising. This event cannot be cancelled and have the same set of arguments as the OnRowDropping client event. Combining the client and server part completes the circle and separates logically each part of the drag and drop process until it is finalized. For richer end user experience you can ajaxify the grid via RadAjaxManager and use RadAjaxLoadingPanel indicators. Otherwise the drag and drop operation will be performed with plain postback. When dragging an item within the grid to reposition it, the grid can scroll automatically with the drag operation. The only requirement is that you enable scrolling. When configuring scrolling, you may also find useful the Height vs. ScrollHeight article. You can stop the automatic scrolling by setting ClientSettings.AllowAutoScrollOnDragDrop="false". The user can drag an item to an arbitrary element on the page or another grid. The originatig grid cannot know about that other HTML structure or its scrolling setup, so scrolling for the drag-and-drop operation is available only within the source grid. On mobile devices the row drag-drop and scrolling features in the grid are performed by the same touch gesture: dragging of the content area of the grid. This imposes a limitation when both features are enabled on touch devices because it cannot be exclusively determined which one of the two should be performed. One way to distinguish between scrolling and row drag-drop on mobile devices is touse a GridDragDropColumn - this way the dragging of the rows will be performed only when you drag a row by the icon in theGridDragDropColumn and on the rest of the content area scrolling will be performed. With single row selection enabled (AllowMultiRowSelection="false") the items will be automatically selected when a drag action is triggered. With multi-row selection enabled (AllowMultiRowSelection="true") a prerequisite is first to select row(s) and then drag to reorder them/drop them over other grid/html element. <telerik:RadGrid RenderMode="Lightweight" runat="server" ID="grdPendingOrders" Skin="Silk" OnNeedDataSource="grdPendingOrders_NeedDataSource"
<telerik:RadGrid RenderMode="Lightweight" runat="server" AllowPaging="True" ID="grdShippedOrders" Skin="Silk"
command.CommandText = "SELECT o.OrderID, o.CustomerID, o.RequiredDate, c.CompanyName FROM orders o INNER JOIN customers c on o.customerID = c.customerID"